Our Star Plan Professional lawn care program is designed to position your lawn for optimal growth, health and longevity. All of our Star Plan Pro applications are 100% environmentally-friendly and have been carefully selected for the Ontario geography and climate. Canadian Property Stars works directly with Turf-Grass Industry Leaders to source the highest quality Over-Seeding Blend for your geographic region. Our certified A-List seed varieties cannot be purchased in retail stores or garden centres. While the wholesale cost is much higher than lower quality seed blends, we have found that they offer excellent value for the results they get for our customers. This golf course-grade seed blend is designed to strengthen the Bluegrass base of your lawn, while utilizing Red Fescue and Ryegrass to populate the shaded and hard-to-grow areas on your property. Canadian Property Stars uses Milorganite, an organic nitrogen fertilizer proven to work on everything that grows. Since it contains virtually no chemical salts, there’s no need to worry about burn spots on the surface of the lawn. Another nice feature of Milorganite is that it promotes beneficial microbial activity which will decrease compaction in the soil and improve its ability to absorb and retain water. Milorganite’s slow-release formula provides nitrogen to the lawn over an 8-to-12-week period. This is critical to minimizing the problems of excessive turf growth such as overly frequent mowing, abundant grass clippings and excessive thatch build-up. Lastly, Milorganite is formulated with 4% iron to really get the green going in the lawn. Iron is essential to the formation of chlorophyll and Milorganite has the right amount to help customers Spring into Green! Spring and Summer Fertilizer: Applications #1 and #2 are mostly composed of a slow-release (60-80%) nitrogen formula for continual feeding over an 8- to 12-week period. Fall Fertilizer: Application #3 is higher in phosphorus and potassium to promote root-system growth through the fall and hardiness for the winter ahead. The ultra-important service of Core Aeration is quite simply the very best of turf-grass cultural practices th t can be performed on a lawn each year. Our mechanical core aeration machines remove thousands of small cylindrical cores of earth and grass from the base of the lawn. This service effectively breaks up the thatch barrier that forms on the top of the lawn after a long winter season. As this barrier is broken down and the soil compaction resulting from the weight of the snow is relieved, the lawn is now able to breathe again and can absorb all that the new growing season has to offer. Spring rain, oxygen and nutrients will quickly reach the root system with ease, enhancing the effects that they produce. Click here for more information on aeration. Discover our service areas for Ontario. How will I know when we have received a service visit and what the visit was for? When our service technician finishes each treatment, he/she will leave a flag in the lawn and a brief note at the door containing the relevant information and instructions. How much time is spent during each service visit? The amount of time for each service visit depends on the size of your property and on the nature and number of applications being performed. A service visit can last anywhere from a low of 5 minutes up to a high of 30 minutes. We attempt to organize ourselves to operate as efficiently as possible in turn allowing us to provide our valued customers with the highest quality products and services for a reasonable price. It rained right after your service visit. Will that hinder its effectiveness? Rain will never negatively affect your Star Plan treatments. In fact, rain actually helps activate and maximize the effectiveness of the fertilizer, seed and lime we apply to your lawn. What is the difference between the organic fertilizer used in the Star Plan and “regular” fertilizer? Synthetic fertilizers are “fast food”, best known for being fast-acting once they are watered in. Synthetics are manufactured chemically with high burn and leaching potential. Organic fertilizers are “slow food” and obtain their nutrients from natural sources. Organic fertilizers build the soil structure, feeding plants slowly over a longer period of time. The organic fertilizers used in the Star Plan contain no chemical salts, which can burn vegetation. How long do I need to stay off the lawn after each Star Plan service visit? What about my pets? All of the products used in the Star Plan are non-toxic to humans. However, some dogs are attracted to the odor of organic fertilizer. Therefore, to reduce the attraction we recommend watering your lawn after each fertilizer application and keeping your dog(s) off the lawn for 24 hours. The form of lime we use – dolomitic lime – is non-toxic to humans and grass and will not cause any pollution problems. How should I water my lawn? Your lawn needs 1 to 1-1/2" (3 to 4 cm) of water per week. Regular, moderately deep watering is better than a light sprinkling every day. Spaced out, deep watering allows enough time for the lawn to dry out which encourages the roots to penetrate deeper in search of moisture. Watering in the morning is best. Late day watering should be avoided since it may promote disease activity in the summer months due to insufficient drying time before nightfall. If you see signs of water deficiency (blue-grey colouring and persistent footprint marks) you should water your lawn right away to replenish your turf (no matter the time of day). What do you recommend for mowing height and frequency? Moving frequency will vary according to the rate of your lawn’s growth, which changes with weather conditions and the availability of nutrients. The height of your lawn is what you should focus on with the most important advice being not to cut your grass too short. A good rule of thumb is not to remove more than 1/3 of the leaf blade at a time to minimize the shock to the plant. Leaf blades that are too short have a decreased ability to manufacture food through photosynthesis. Low cutting also weakens the root system, affecting your lawn’s ability to take up water and nutrients from the soil. Lastly, we advise you to sharpen your mower’s blades at least once a year to ensure a clean cut that heals quickly. 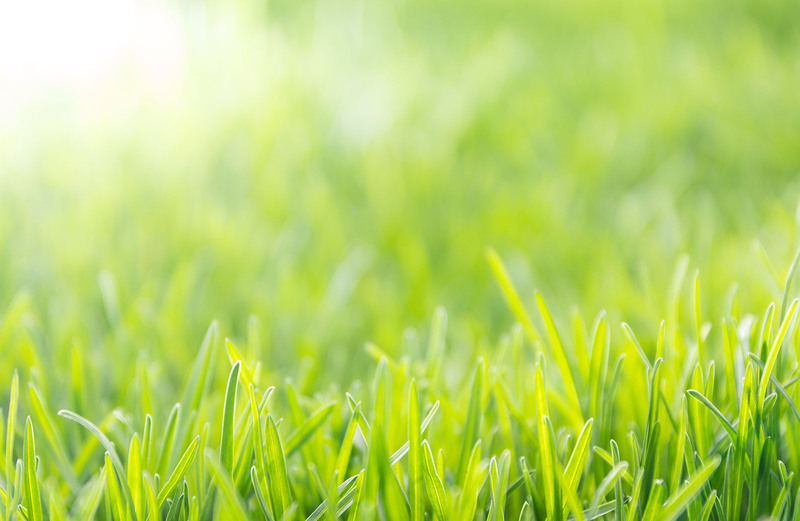 Your grass clippings should be left on the lawn after mowing. Grass clippings are about 90 percent water by weight and are high in protein, so they should be left on the lawn to decompose and return nutrients back to the soil. We would only recommend removing grass clippings if they are very long and could smother the lawn.